← Outsourcing ESIC’s recruitment process to private agencies: Is it valid in law? Time spent traveling to and from work is “work”- European Court of Justice ! Opposite is in India, run by businessmen-controlled-politicians, notwithstanding Sec. 51-E, which was a definite progress, in spite of procedural difficulties. “Requiring them to bear the burden of their employer’s choice would be contrary to the objective of protecting the safety and health of workers pursued by the directive, which includes the necessity of guaranteeing workers a minimum rest period.” – says the European Court of Justice. Increasing the spread-over period to 12 hours is shown as the a safety and health measure in India. 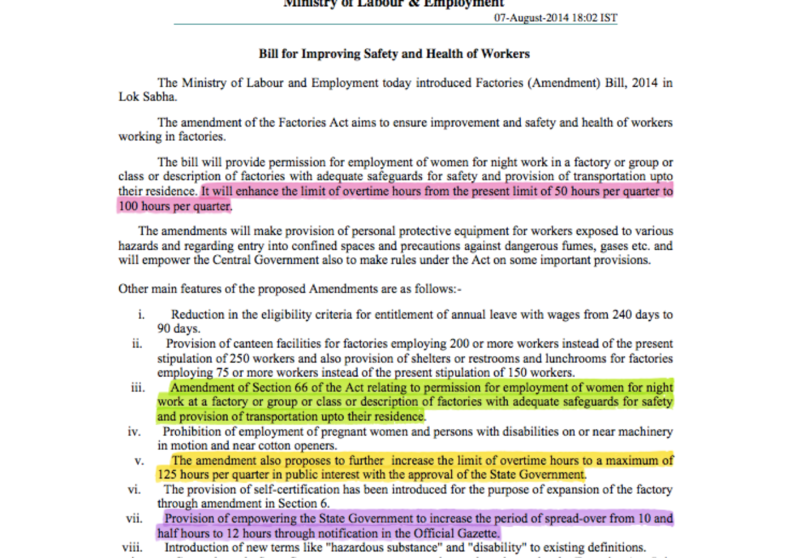 There is no necessity to guarantee the workers any “minimum rest period”. Mayday revolution resulted in 8+8+8 hours, i.e., 8 hours for work, 8 hours for forest, recreation with family and 8 hours to sleep. But, already the official 8 hours work has become 12 hours including the time taken for commuting to and fro workspot, in India. When the spread-over period is 12 hours, and the journey between the residence and workspot takes another 4 hours, where is the time for rest, family and sleep? We are creating a society that would be poor in health and would need more medical attendance resulting in more expenditure on medical side by the ESIC and the State. We do not care for any respectable slot in the Human Development Index or Global Prosperity Index. Those who can change things, do not do their bit. But, they work for extricating themselves from that situation personally. When are we going to usher in a civilised society free from exploitation?